Ran from/to dates: ~August 1998 (a month before C2) - 2001? Motto: "Proud to be older than the [JNCOBOY] EVERYONE READ!!!! thread!" A strange mix of wolfling run, breeding stories, and what many would consider norn torture, this site matched various creatures against one another in Albia, and documents the results. Includes many, many screenshots. 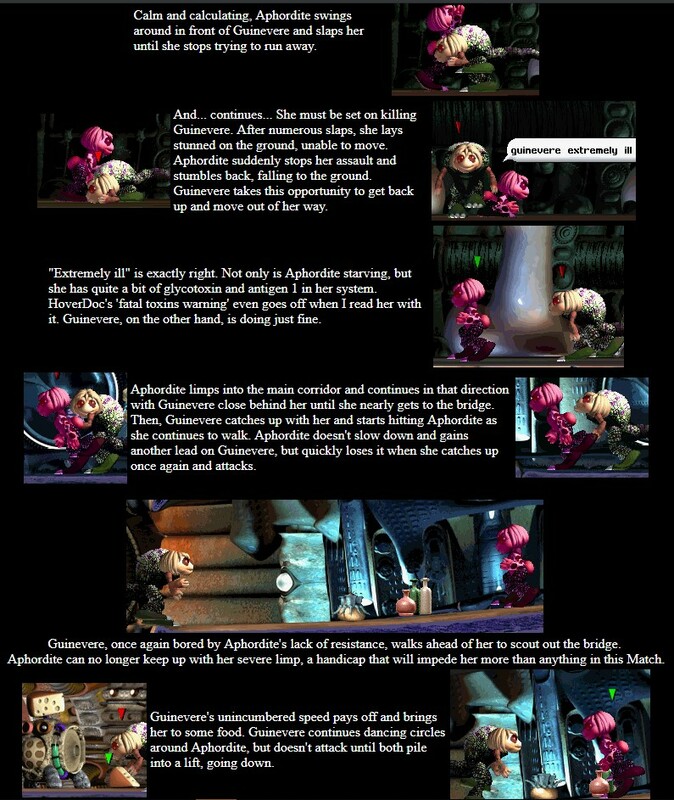 GreenReaper: Actually, some of the match descriptions are really quite neat and don't end up the way you'd expect. Worth a read. 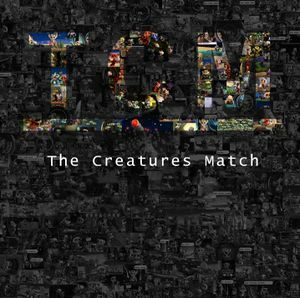 The Creatures Match has had many hosts (and at least one imitator). Initially entitled The Norn Deathmatch, it proudly proclaims to be "older than the [JNCOBOY] EVERYONE READ!!!! thread!". 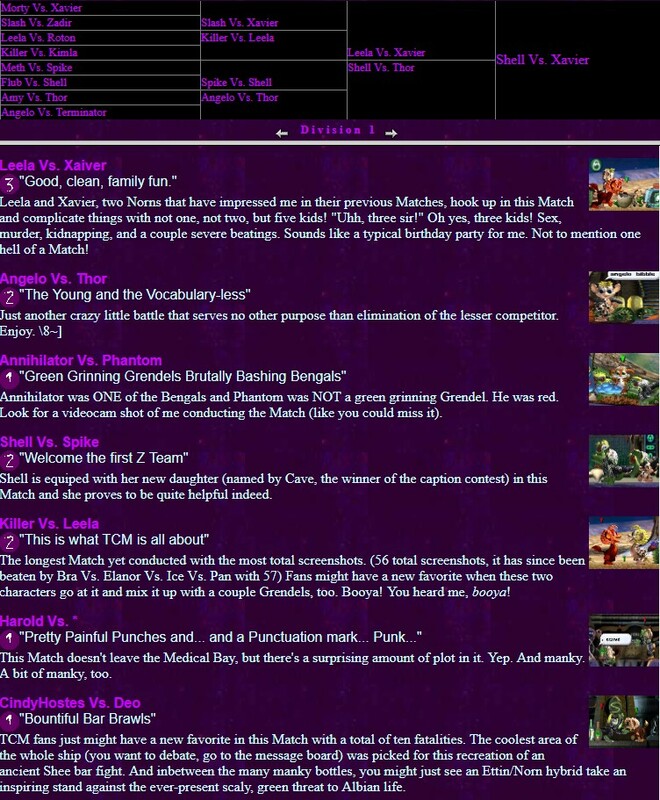 The initial match took place "roughtly a month before Creatures 2 was released" (28 August 1998) (dead, formerly at members.fortunecity.com/tcm1/c1). The site suffered a setback when on 20 September 1999 the entire site content was deleted. By this time it was already on its second official design. The site was rewritten and moved to HomeCreatures, where it would stay until the end of summer of 2000. Breeders would submit norns, ettins, and grendels to be pitted against each other in a survival tournament. Each match would be observed, narrated by Phantom, and documented with screenshots until one of the creatures died, either as a result of being attacked by other creatures, starvation, disease, or falling victim to traps. The survivor would be exported and advanced to the next stage of the tournament. If two competing creatures produced offspring during the match, the surviving competitor was allowed to bring his or her children along to their next match. These competing family units were called "Z Teams". A virtual text-based tour of the fictional "TCM Facilities"
Phantom often did matches with narrations (dead, formerly at members.fortunecity.com/tcm1/matches/c.html). This page was last modified on 8 February 2019, at 17:22.